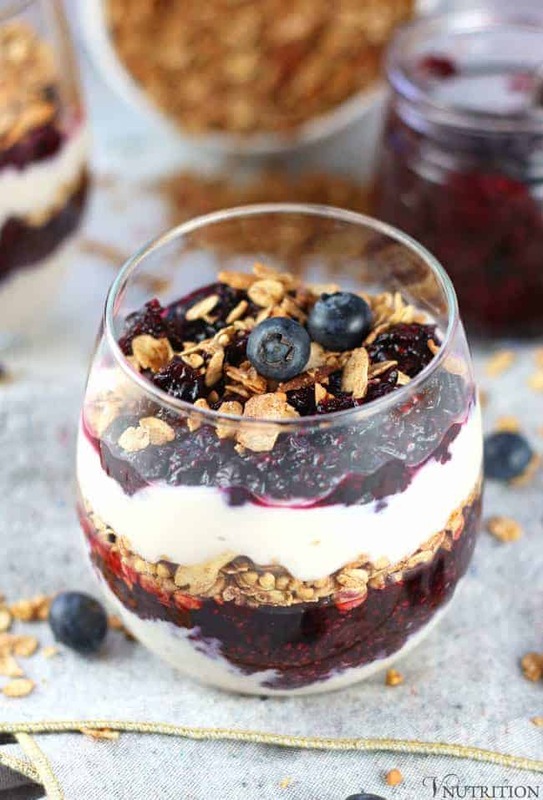 This Vegan Yogurt Parfait is not only delicious, it’s healthy too! 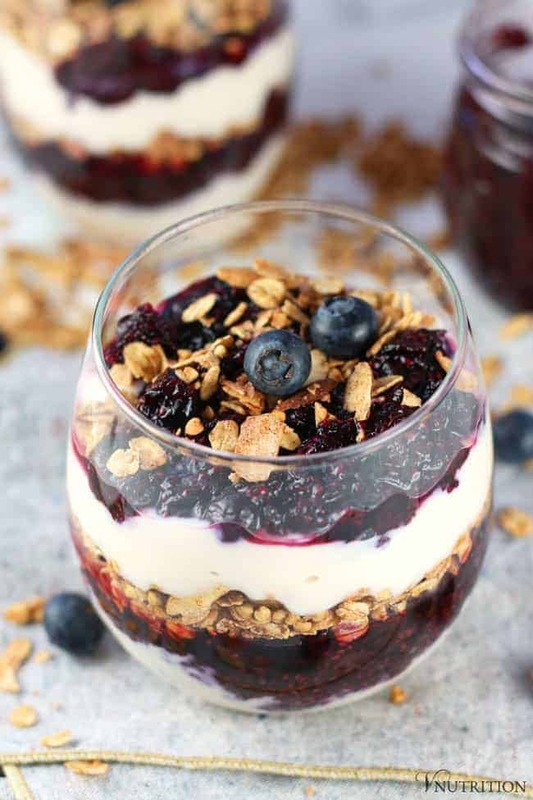 Layering dairy-free yogurt, chia jam, and refined sugar-free granola, this parfait can be a great breakfast or even a dessert. Ever go to a fancy restaurant or cafe and see a pretty parfait in one of those glass cases looking all perfect? I always want one of those. So I decided to make my own version to share with you in case you wanted something fancy to impress guests…or for yourself, because you deserve something pretty to eat. So What is a Parfait Exactly? According to Wikipedia, a parfait comes from the French meaning “perfect”. In France, a parfait is made by boiling cream, egg, sugar, and syrup which creates a custardy dish. The US version includes things like granola, nuts, yogurt, and/or fruit that are layered and served in a tall glass. I’m going with the American version because it’s prettier and I love that layered look. These would be great for brunch or a special occasion like Mother’s Day or someone’s birthday breakfast. 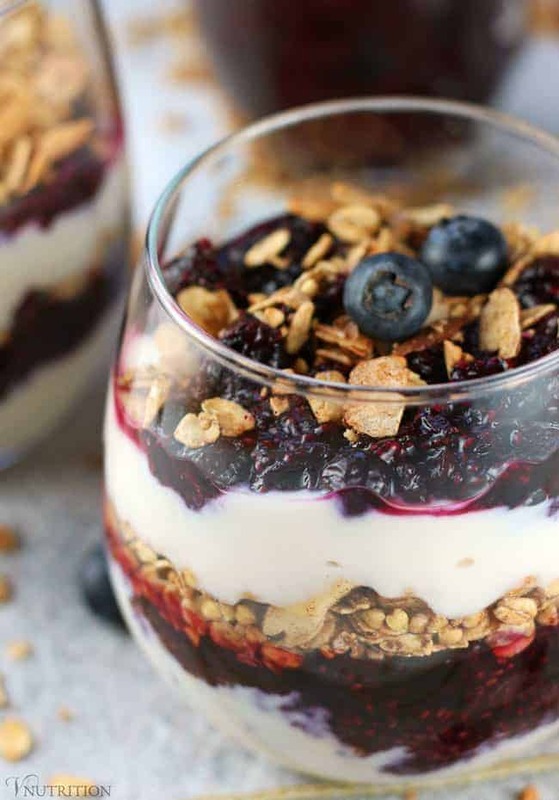 Because parfaits are often made with yogurt, fruit, and granola, people assume they’re healthy (as did I) but au contraire mon frère, they usually are not. 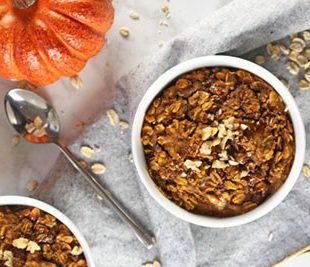 Commercial yogurt and granola can both be loaded with refined sugar which spikes our blood sugar (and we don’t want that). Oats themselves are great for blood sugar regulation because of soluble fiber in them. 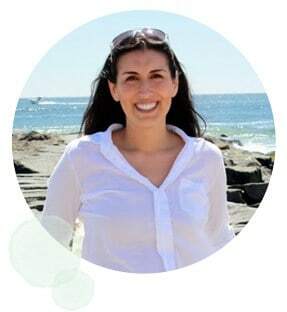 Soluble fiber forms a gel-like material which can help lower blood cholesterol and glucose levels. However, we don’t want them covered in sugar which would undo the healthy benefits. Yogurts are another food that can be laden with sugar. You don’t need you yogurt to be sweetened because the chia jam is sweetened by the berries and there’s a bit of maple syrup in both the jam and granola. If you’re looking for some good unsweetened dairy-free yogurts, my favorite unsweetened yogurts are So Delicious, Anita’s, and Kite Hill. 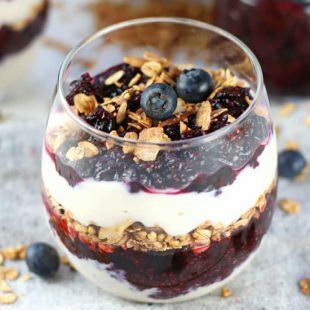 The best part about these parfaits are that they are easy to put together, especially if you pre-make the granola and chia jam. I usually have batches of both made at all times. The chia jam can be made ahead of time and it keeps in the fridge for up to 2 weeks. 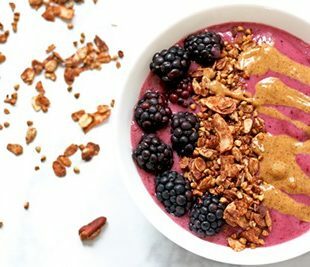 I also always have some granola in a jar to top my yogurt or smoothie bowls. You can also switch things up and use my Strawberry Chia Jam and Chocolate Buckwheat Granola to make a Chocolate Strawberry parfait! This Vegan Yogurt Parfait is not only delicious, it's healthy too! 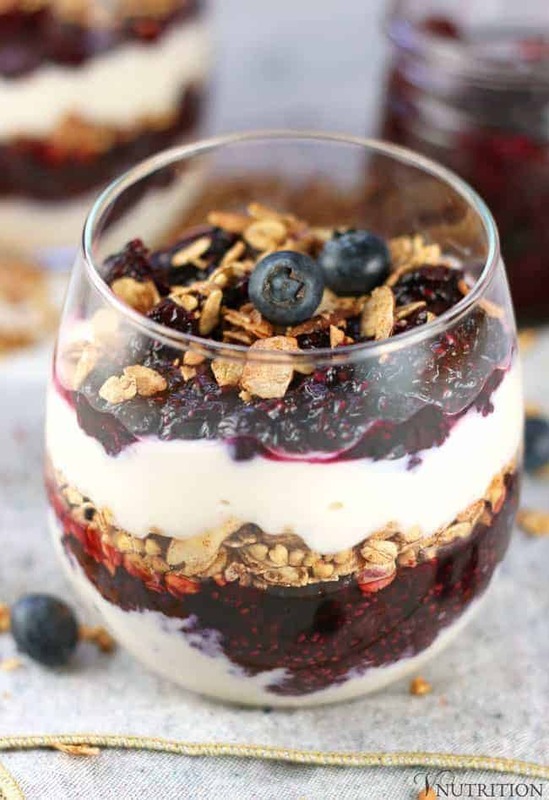 Layering dairy-free yogurt, chia jam, and refined sugar-free granola, this parfait can be a great breakfast or even a dessert. Layer half the yogurt, then half the jam, followed half the granola. Repeat with the second halves of the ingredients and top with fresh berries. Feel free to add more jam or granola to you liking. This looks wonderful for a fun treat and I need to try making the chia jam, yum. Thanks! 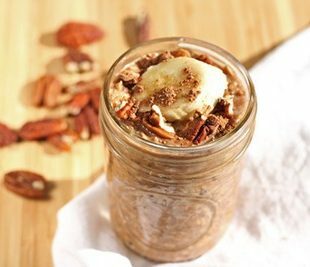 This is a perfect match for the warmer weather and looks fun for breakfast, snacking or dessert!